We rent our great coaching / seminar room (19 qm) with a writable chalk board wall in Düsseldorf Flingern; hourly or daily basis. A flat screen with HDMI cable and Apple TV are present. 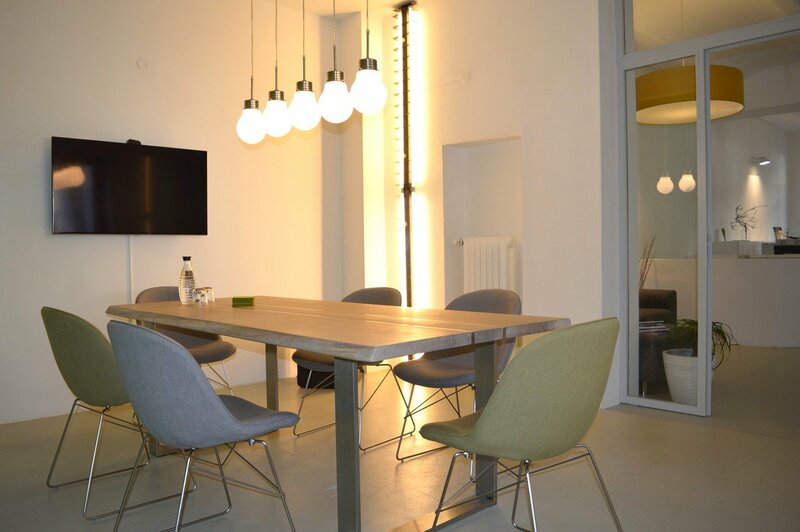 The room is part of our loft office space and suitable for small groups up to 8 people. 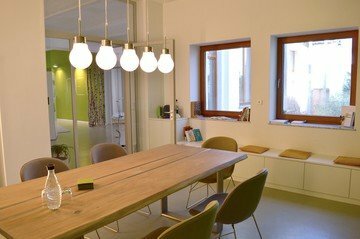 Use of the kitchen, the green courtyard and Wi-Fi are included. On request coffee (Nespresso or Beans) or tea can be booked per person. The daily rate is from 8:00 to 18:00 o'clock. Later departures will be charged per hour. Wheel chair access only for the meeting room. The toilets are not accessible per wheel chair.